The Earth is changing all around us and the signs can not be denied any longer. This page is to help bring attention to these End Time Events taking place all over the globe. From Bible Prophecy to Solar Flares ,Volcano’s,Earthquakes to Nibiru/Planet X ISON ,Chem-trails ,HARRP, New World Order .We will bring you the latest Breaking News and updates. SPRINGVILLE, Utah – Police have issued a missing person advisory for an elderly woman who went missing from Springville on February 19. 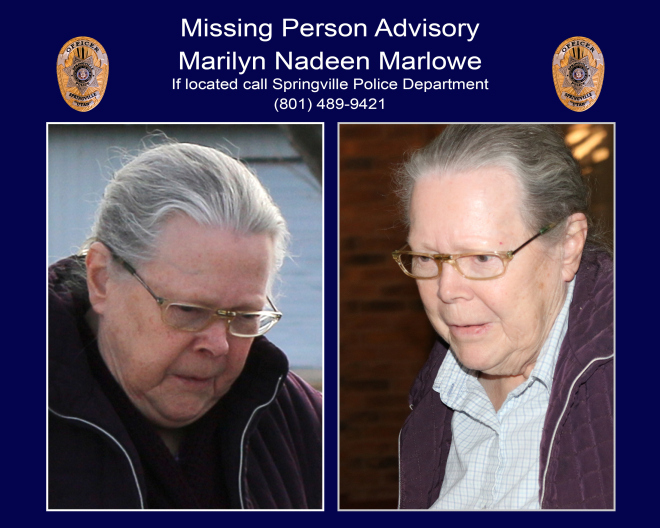 According to information from the Springville Police Department, 78-year-old Marilyn Nadeen Marlowe was last seen in Springville driving a white, 1995 Ford Contour with Utah license plate: 785UYF. Officials said the woman may have early stage dementia and can become confused. The woman also has a heart condition, and she does not have her medication with her. Marlowe, pictured above, is described as a white female who stands 5-feet 5-inches tall and weighs 145 pounds. She has gray hair with brown streaks. She has blue eyes and wears glasses. Anyone with information regarding Marlowe is asked to contact the Springville Police Department at (801) 489-9421.